Uncommon Sense - truth less ordinary: Who's special? 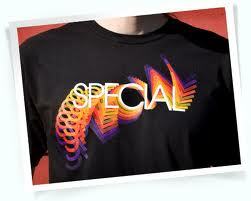 A lot of us have grown up with the idea that it’s special to be special. We’ve been looking for special qualities in that special someone and been carried away with the idea that we’re going to live especially ever after. Well, I’ve got news for you….there’s nothing special about being special. Thinking ourselves as special is the work of the ego, the unhealthy side. This is the part of us that is constantly seeking attention and feeling superior. When we’re in super-ego mode we look down on others and get more than a little selfish. When we look for a partner we look for special qualities. Kind and caring individuals who will complement our own special qualities. No one can make you feel special...you just are! A large dose of arrogant esteem disguised as confidence makes us appear distinct, exceptional, extraordinary and unique…and we are are…but so is everyone. If everyone’s special and we fully accept it then there’s nothing to crow about. We’re all equally special not especially special! No two people are made the same or think the same way. If you want to know why there’s so much conflict in relationships then there’s your answer – sweet and simple. There are special problems that feature in relationships such as the balance of respect. How much to give and how much to take? Often we feel that we’re too special to give more than we take. Some of us are so special that we just take, take, take with little reciprocity. Our divaesque egos believe that it’s our right to have what we want…..and it is ….as long as it doesn’t interfere with another’s freedom. What we call special things are the abstract; things that we can’t see or touch. Happiness…however it’s defined….kindess…particularly when its unexpected….wisdom…since it’s rare….and freedom..the most precious state of all. What the world labels as special are those children of a lesser God. A god that understands that sensory disability is a teacher to mankind. They have come to earth with a special purpose and those that they choose to share their lives with are honoured. When we truly understand why we’re special then we follow through – seeing, doing and being. At the moment, we just do special stuff randomly since if we did it every day then it’d get ordinary. Special is a feeling, a thought, a voice in your head, your soul calling. I am special and so are you. Since we’re both in the circle of specialness then there’s nothing further to say. I cannot be greater than you and you cannot make me feel small. This is where true equilibrium happens.....and that's special!